This post goes back to another Thursday lunch break so I’ve dragged Gabriel along with me again on more food adventures. It was quite awhile ago though, so apologies if my memory isn’t clear! I really should learn to take notes. After my previous post – which was basically an ode to mentaiko – I am back at Ramen Ikkyu, this time with a sweet invite from Chef Haru himself. He was probably a mixture of mildly amused and delighted that I enjoyed my mentaiko ramen so much that he’s asked me to come back and try his hiyashi ramen with mentaiko. 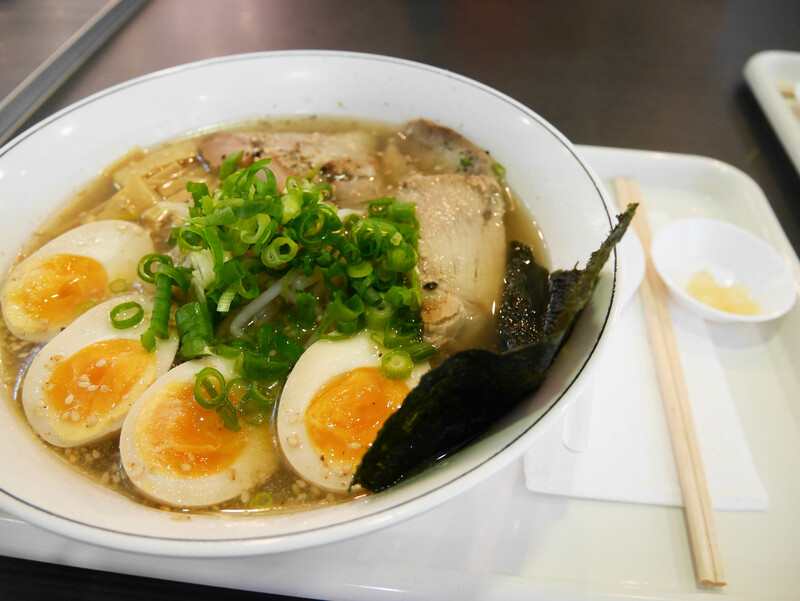 Before we get to the main event, here’s Gabriel’s Tokyo Salt Ramen ($11.50) with an extra onsen tamago. The key to a great onsen tamago I believe, is having really flavourful egg white that isn’t too salty and of course egg yolk like flowing lava. Close-up view of the onsen eggs. I don’t know anyone who doesn’t love them! Learning how to make them at home is definitely going to be a thing soon, I’d put them in everything. Finally, here is my summer ramen/Hiyashi ramen salad ($16). The base is katsuobushi which Chef Haru began making early that morning. 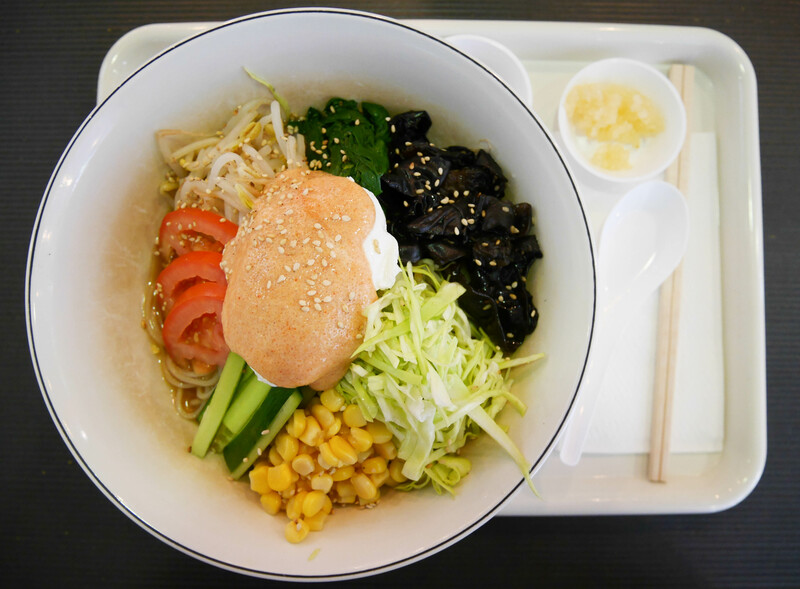 Toppings are cabbage, corn, cucumber, tomato, bean sprouts, spinach, seaweed, and of course mentaiko mayo! 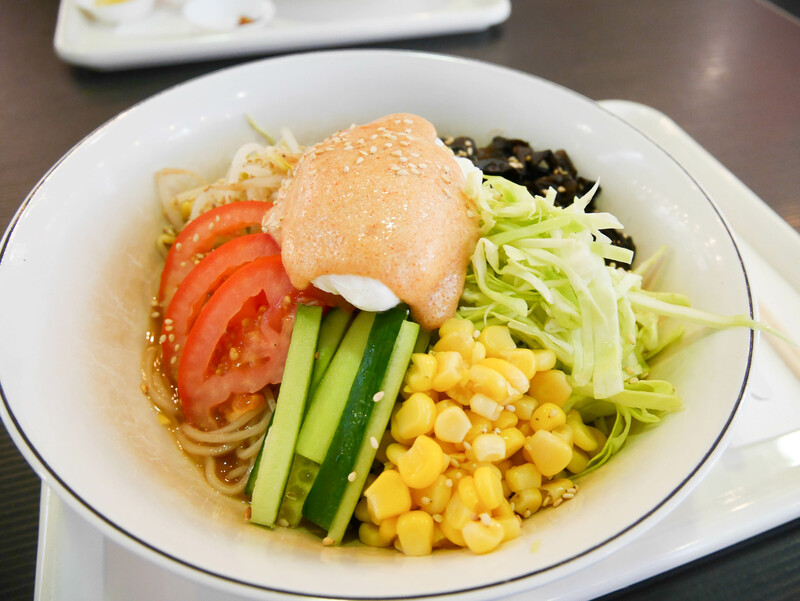 There is also a poached egg hidden underneath all that mentaiko goodness. I’m not sure how to appropriately describe this as I’ve never had cold ramen before. The best comparison I can give you is cold soba. It is that similar taste of refreshing-ness except even more so by several magnitudes because all the toppings are so crisp and fresh! I really, really loved this, particularly because that day was a really hot day as well. Luckily for Gabs I couldn’t finish it so he got to have some and he also agreed that it was perfect for the weather and tasted pretty darn delicious. Unfortunately though this looks to be a one off and isn’t going to be on the menu any time soon! Stay tuned for updates as I continue to beg Chef Haru, because I really want to have this again. 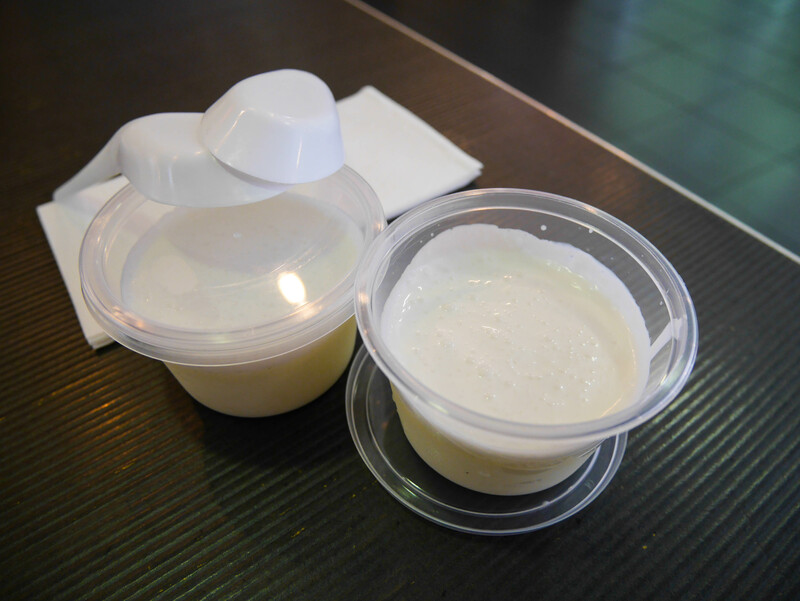 Lastly a small and sweet dessert in the form of lemongrass panna cotta. I’m usually really not a fan of panna cotta but I think the tartness made it a lot more palatable for me than it usually would be. Lemongrass is also so great, another testament to how much I love Thai flavours. 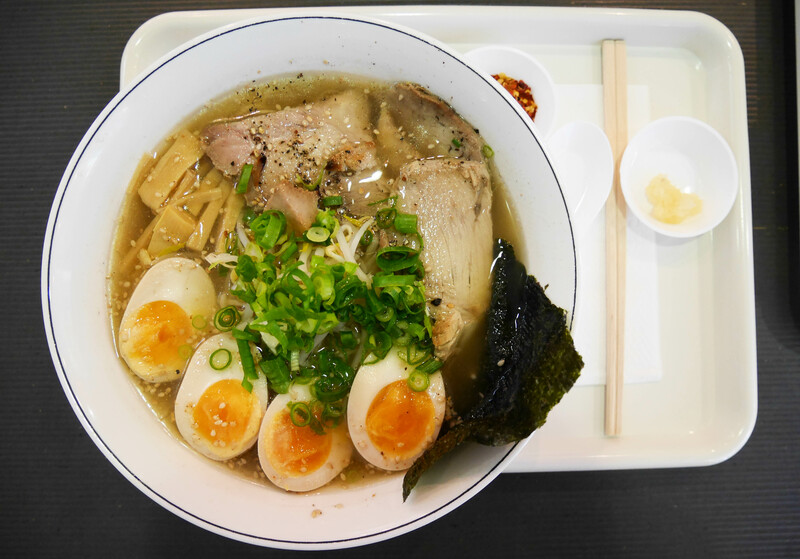 I should hope that everyone knows Ramen Ikkyu by now, definitely one of my favourite ramen joints in Sydney. Meal was paid in entirety by Samantha and her dining guest. Panna cotta was complimentary. Love cold ramen in summer. So refreshing! Never tried cold ramen… looks good! Never tried cold ramen before.. looks good! I love noodles and having them chilled is a great way eat in summer. Looks very delicious. Love noodles. Noodles are definitely one of my favourite carbs! I’m pretty keen to give Ikkyu another try as I think I was in a weird state of mind the first time around. Hopefully it’ll be an experience worth rameniscing over. Keen for some ramenggedon times, hit me up when you go! Samantha I will take you anytime! Thanks for the offer! It’s really great ramen.